The exchange of gas across the air-sea interface is of fundamental importance to a wide range of climatic and biogeochemical processes. Both biogeochemical models and largescale climate models crucially depend on the formulation of the air-sea flux of dissolved gases. Yet, there is still considerable uncertainty in the physical processes that control this exchange and how it is mediated by biogeochemical processes. This is especially true in nearshore environments where estimates of air-sea exchange, traditionally derived using wind speeds, are poorly constrained due to limited fetch, turbulence created by current-benthos interaction, and the presence of surfactants. Direct methods of measuring air-sea flux are a promising approach for improving estimates and understanding of air-sea gas exchange. One such approach commonly employed is the eddy covariance (EC) technique, a common technique in the atmospheric boundary layer over terrestrial ecosystems. 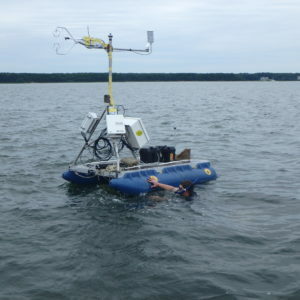 This approach has also been applied to ship-based measurements to evaluate air-sea exchange of carbon dioxide, heat, and water and has most recently been adapted underwater to examine oxygen exchange between the sediment and the overlying water. Here, I proposed to combine atmospheric EC and a newly-developed floating EC platform to examine air-sea gas exchange from both the air- and sea-side, all in coastal environments where traditional air-sea exchange estimates are known to contain significant biases. The use of multiple tracers in the atmosphere (oxygen and carbon dioxide) and underwater (oxygen) will allow for a comprehensive evaluation of air-sea exchange, how it is influenced by physical forcing, and allow for the development of new algorithms for determining gas transfer rates from common parameters (e.g. wind, tidal currents, fetch, and waves). 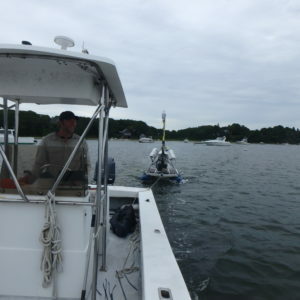 Ultimately, this research will help to determine the influence and importance of coastal ecosystems in global climate models which, despite the recognized and significant rates of biogeochemical cycling in coastal systems, are not resolved in global climate models. It is expected that the new floating EC platform proposed here will also have significant future applications in determining air-sea exchange throughout the ocean as new sensor technologies become available and will be transformative in the analysis of atmosphere-ocean interactions. This was made possible through a generous donation from the Eastman Chemical Company To the Ocean and Climate Change Institute at WHOI.